Do you see the interesting part? It has very little to do with the question about Ma, which breaks down pretty much as one would expect. The unexpected part is the party ID. More respondents identify with the DPP than with the KMT. It’s not a big gap, but this looks different. The KMT has almost always enjoyed a comfortable lead over the DPP in party ID. Has this lead disappeared? 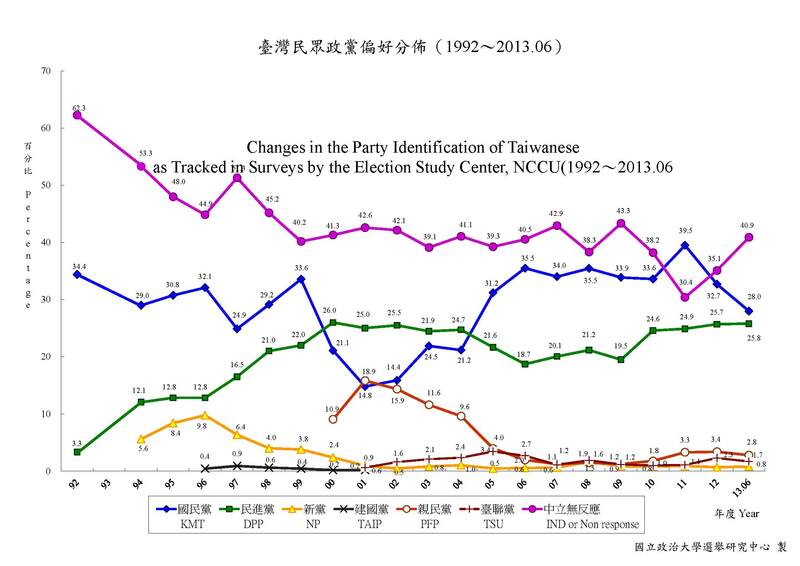 Our best long-term tracking of party ID comes from the Election Study Center, National Chengchi University. 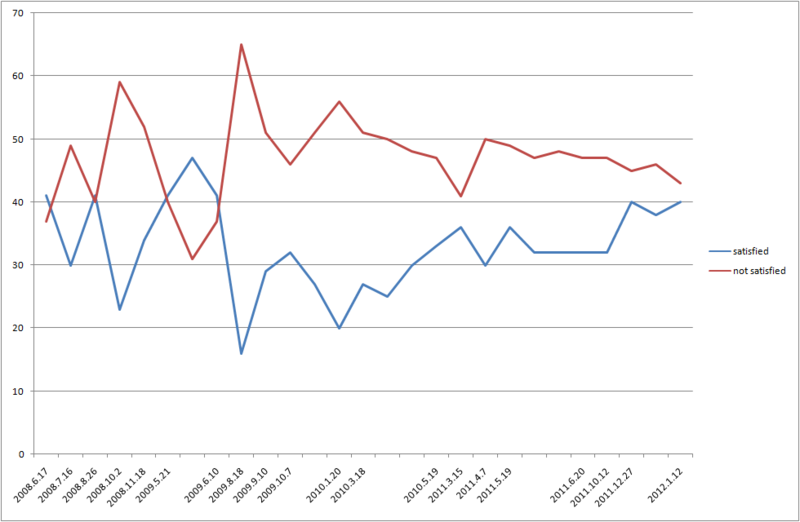 You can see that over the past two decades, the DPP has only surpassed the KMT in one period, the early 2000s. However, that was precisely the high point for the PFP. If you add the KMT and PFP together, the pan-blue party ID was always significantly ahead of the pan-green party ID. Is this changing? The last data point in the ESC data is from June, long before the recent KMT civil war broke out. Even then, you can see a drop in KMT party ID. 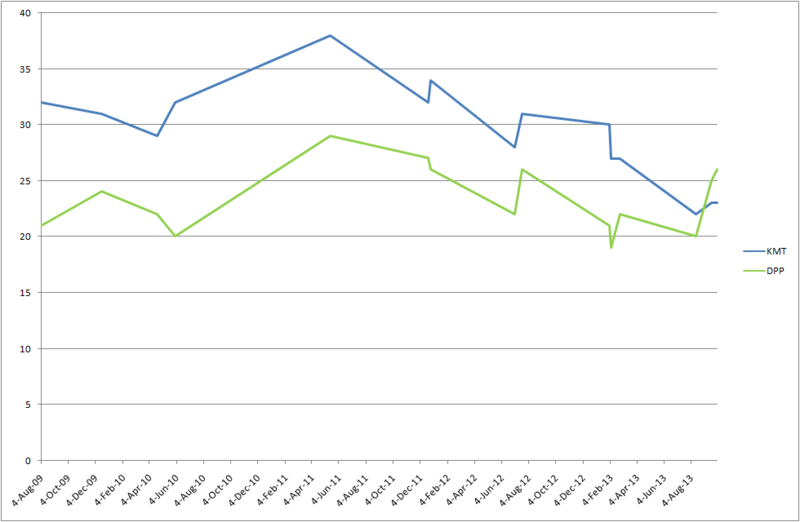 There is no corresponding rise in DPP support or rise in PFP or NP support. Instead, former KMT supporters seem simply to be moving into the non-response category. Let’s take a short detour into President Ma’s satisfaction ratings. We all know that Ma has dismal satisfaction ratings right now. However, he had dismal satisfaction ratings all through his first term, too. That didn’t seem to hurt the KMT at the polls. They did just fine in 2010 and 2012, winning three municipal mayors, a solid majority in the legislature, and another term for Ma. So maybe low satisfaction ratings don’t matter much. KMT supporters might gripe about Ma, but when they get into the voting booth they will still vote for the KMT. However, let’s take a closer look at the data. Here are the results from TVBS surveys over Ma’s first term. What you might notice is that Ma had terrible satisfaction ratings at various points in his first term, but they went up and down. That seems to indicate that the dissatisfied people weren’t all that dissatisfied. A few months of good news could sway them back into the satisfied category. Moreover, Ma was able to recover for the elections. 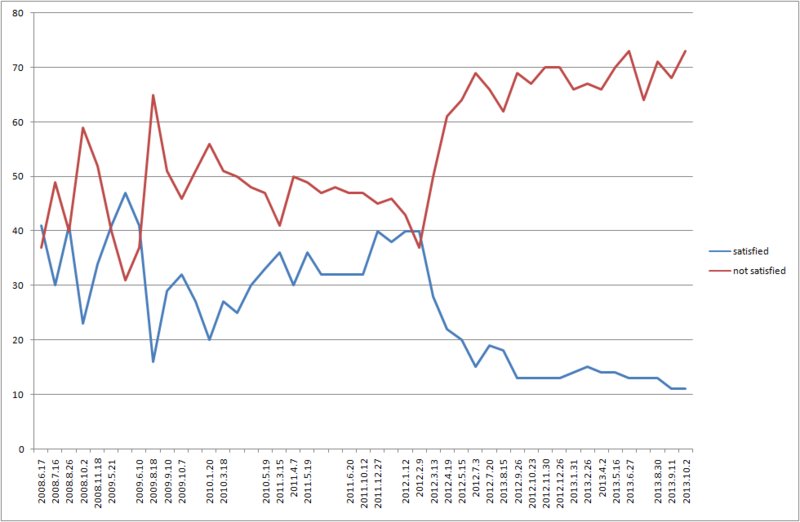 By late 2010 and January 2012 (when voting occurred), his satisfaction and dissatisfaction rates were very close. KMT supporters were mostly happy with his performance when they went into the voting booths. So it might not be that surprising that the KMT did well in those two elections. The thing is, I’m not sure people realize just how different Ma’s second term looks from his first. Here is the same graph, but now extended into Ma’s second term. From the very first days of Ma’s second term (actually, long before he was inaugurated in May 2012), Ma’s ratings plunged. The American beef fiasco devastated his support, the Lin Yi-shih scandal in July deepened dissatisfaction, and he has never recovered. Unlike the first term, his support has not gone up and down; it went low and stayed low. That doesn’t look like borderline dissatisfaction to me. Moreover, it has consistently been much lower than even the lowest point in the first term. Remember, as you get lower, you run into increasingly dedicated core supporters. It should be a lot harder to decrease from 15% to 10% than from 45% to 40% because the bottom 15% should be your diehards. I don’t know if Ma can go any lower than his current 10% or so. However, what is distinctly possible is that the intensity of that dissatisfaction could increase. One way we might see an increase in intensity is that supporters might change their expressions on other indicators. That is, the first thing a disaffected KMT supporter might do is express satisfaction with President Ma. However, party ID is a deeper indication of support and doesn’t change as quickly. If party ID is falling, the KMT should be worried. The last two data points are Sept 18 and Oct 1. The KMT is up one point from Aug 13, but the DPP is up 5 and 6 points. That is not like previous differences, when the two had very similar changes. It doesn’t look to me like the DPP is really increasing its support, but it does look to me like the KMT’s support is eroding. Losing a third of your party identifiers is a fairly serious loss. Does this mean anything? Will all those people come back to the KMT when it’s time to vote? We don’t know. What we can say is that this isn’t like four years ago. The KMT is digging a much deeper hole this time around. Today’s KMT Central Standing Committee meeting was apparently pretty testy. At least three people openly challenged President Ma. I’ve been waiting for the a reaction inside the party, and it looks like it is starting to emerge. The three people who have been identified in the media are Lee Chuan-chiao 李全教, Huang Chao-shun 黃昭順, and Lee Teh-wei 李德維. The first two have been labeled as Wang’s allies, while Lee Teh-wei is identified as belonging to the Lien faction (and Sean Lien’s good friend). Huang’s challenge was the least direct. She called for Prosecutor-General Huang Shih-ming 黃世銘 to accept political responsibility and resign. Lee Chuan-chiao and Lee Teh-wei were more direct. The former said Ma is no longer suitable to be the KMT chairman, and the latter called on Premier Jiang to resign. Lee Chuan-chiao also criticized the head of the KMT’s disciplinary committee. At least two members, Hsieh Lung-chie 謝龍介 and Lee Chia-feng 李嘉峰, spoke in support of Ma. Elsewhere, New Taipei City Eric Chu 朱立倫 has also expressed hope that Ma will back off the political infighting and focus on economics. While talking to the TV cameras after the meeting, one of the Lees said that the KMT is everyone’s party, it is not Ma’s personal property. In fact, one of the ways to interpret the last month is as a failed delegation of power. The KMT delegated a tremendous amount of authority to President Ma to act on its behalf. However, rather than acting in the best interests of the entire party, Ma used the power to advance his narrow interests. Now the party is trying to sanction the unfaithful agent. Some of Ma’s power comes from his position as president; some of it comes from the KMT. The latter source of power may be slipping away. You are currently browsing the Frozen Garlic blog archives for October, 2013.